Yay, it is time for my Friday update! So was I as productive as I hoped to be this week? Well, I will let you be the judge. 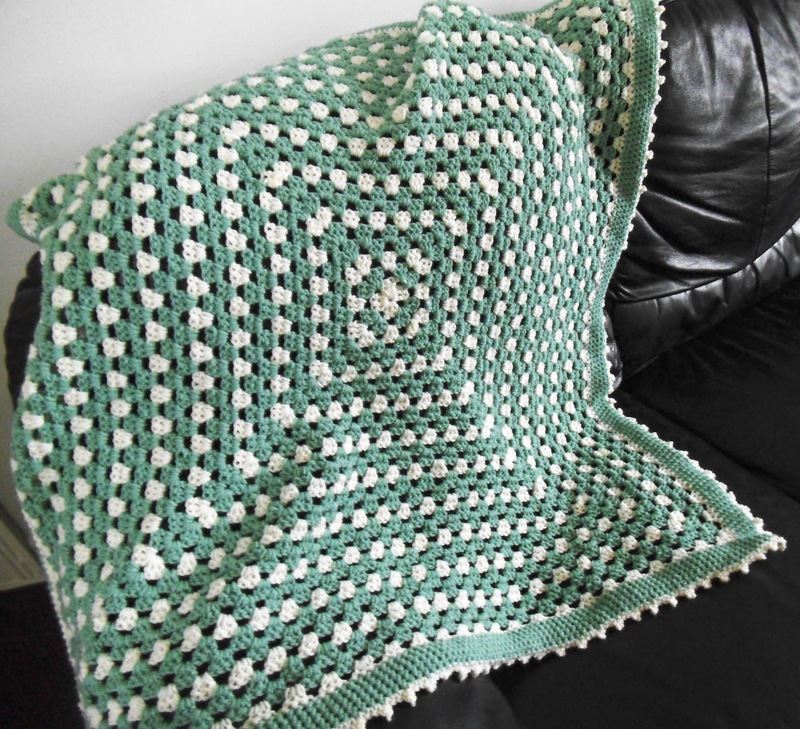 Firstly, I finished my first ever grown up crochet blanket. This one is for a friend but it has given me ideas for the fund raising collection! Yay! Am loving crochet. So am very thankful for taking the time to learn this craft..I like it far more than knitting! And then...well I made a mess! And I do love making messes! I like to think of the floor as an extension of my craft table. I know where everything is and am often inspired by things I 'find'. I love working in my own little world of organised chaos and music on full blast: this week was 'Erasure' week.. I sing loudly as I sew and do the odd dance when the back starts to ache...suprisingly I never see to stand on pins or trip and havent broken my neck once in the clutter! T'is a gift!! Boogying in my craft room is not for the faint of heart! Excuse piccies please..no sun again. These are three mug rugs I made! The first ever, using a combination of donated fabric and my own...all going for the prize draw! 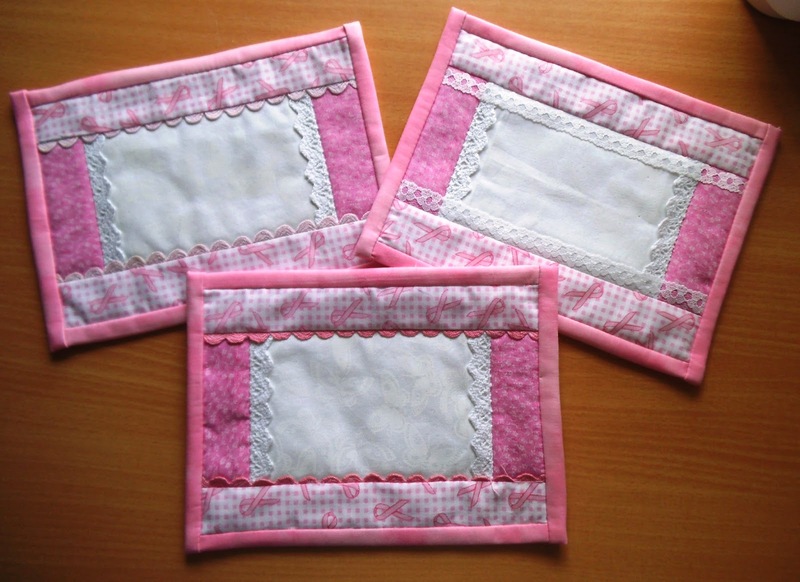 I used the quilt as you go method..and they were really fun to do. That's better. Hang on, what is are Mrs. Bunny and owl looking at? Well, the fairies have to live somewhere don't they? 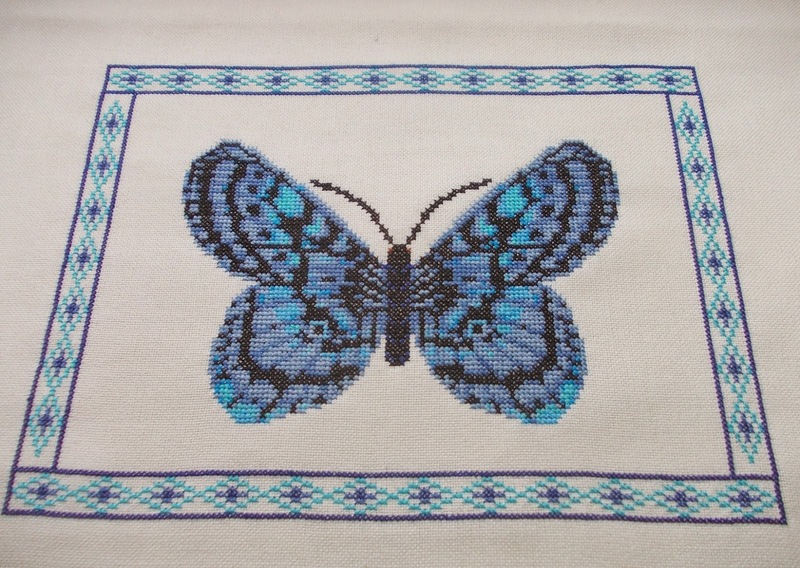 Then Elaine (aka super stitcher) sent me back my new butterfly design. This was stitched by Elaine on 28 count Jazilyn Antique White..which is actually a nice creamy colour..no sun, no decent picture but the blues stayed true to what they are really like. It is soooo beautiful! Thank you Elaine for stitching it for me. I am so thankful I have have things to keep me busy this week. I am also very thankful for the many, many goose eggs I have had laid for me! 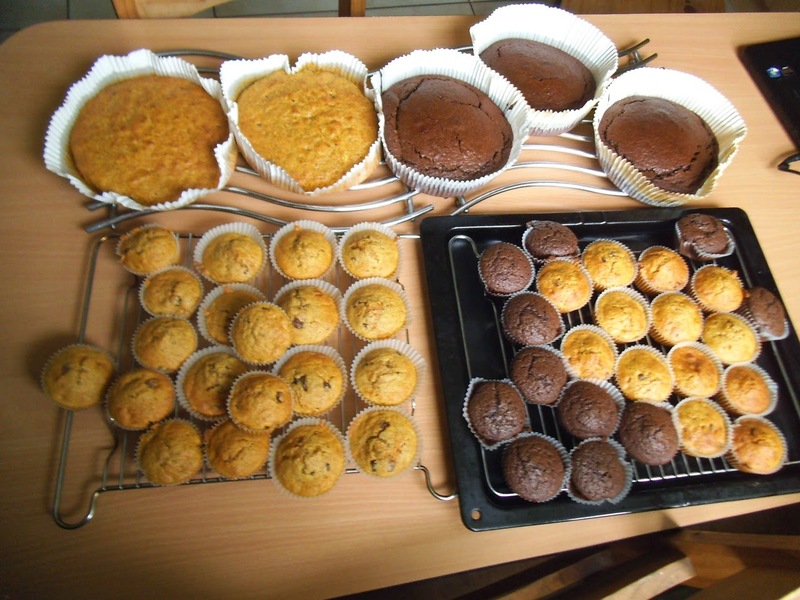 Carrot cakes, carrot cake muffins, chocolate cakes and chocolate cake muffins..all in the freezer. Yum..well apart from the ones I had to test. It is a hard job but someone has to do it! 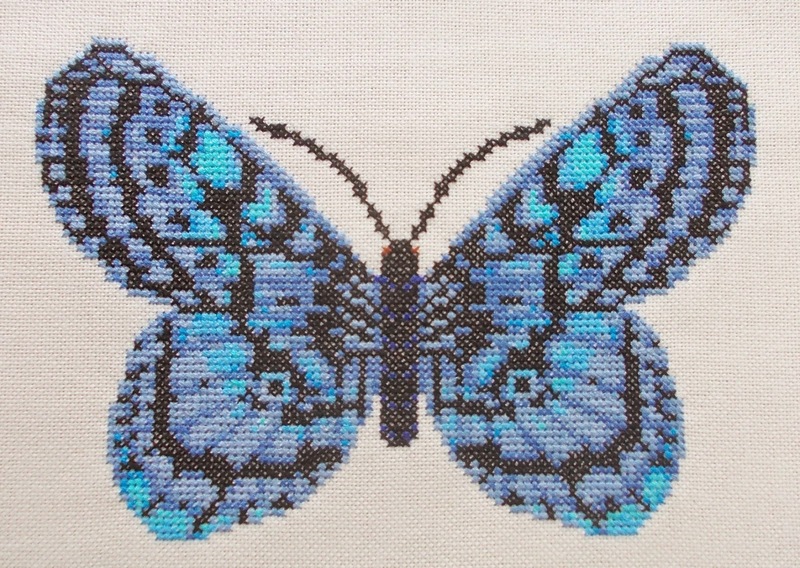 So that is another week done..but I a hopeful of a very busy weekend with oodles of cross stitch! Thanks for reading this far. Have a lovely weekend! What a fun post! I love your blanket! Really? You like crochet better than knitting? Is it because dropping a stitch doesn't make you have to rip out everything & start again? Your mess wasn't too bad ... I could share photos that would top that : ) Loved all your photos, especially the baked goods. Wish we were neighbors ... lol! I've never had goose eggs. Do you use them them same as chicken eggs? Wishing you a happy weekend! Your pin cushion house is very cute, a bit like Rapunzel's. And WOW! loving your latest butterfly, its just simply stunning. 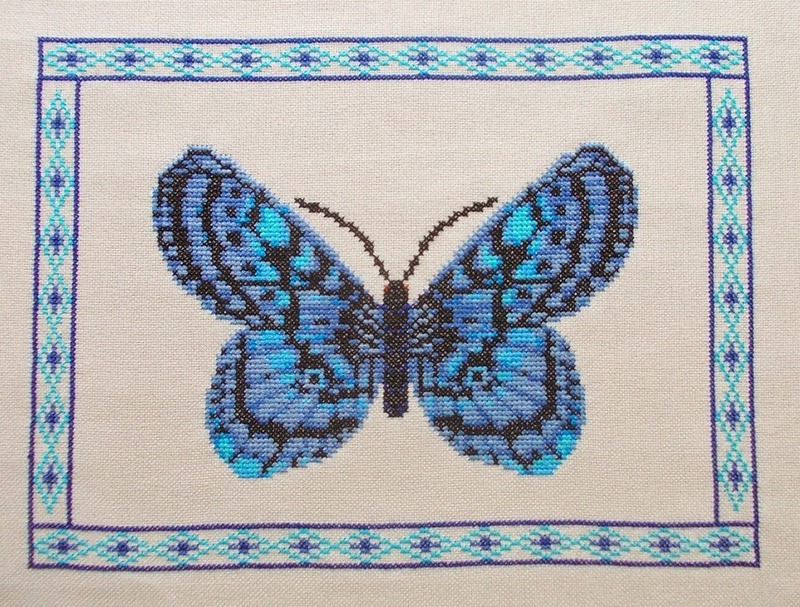 And the mug rugs are so lovely too..
Beautiful blanket and butterfly design. You are truly talented! 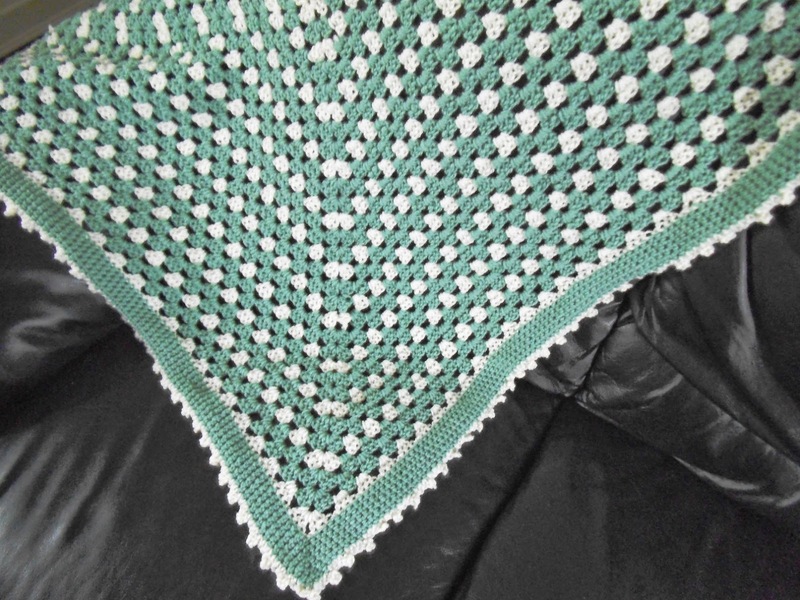 Gorgeous crochet blanket, its so addictive, you've mastered it so quickly. A super little castle pin cushion and mug rugs.